Free iPad to Computer Transfer – Create a back-up copy of your iPad videos, movies, photo, music, playlist and more on your computer for free. Tablet computer or simply Tablet, the most popular of which is iPad, has become the more favored choice by majority of consumers because of its weight, size and mobility. Though, it may not be as powerful in terms of processing capability compared with Notebook/Laptop computers, nevertheless, it has and still is dominating the mobile scene. Here is the good news! 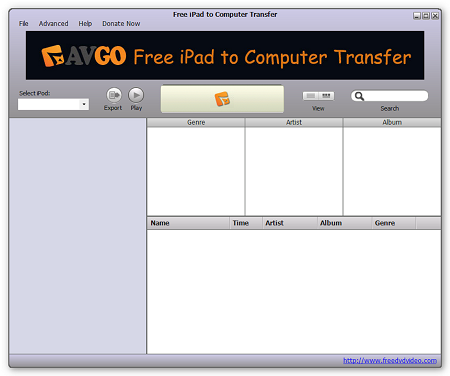 Now, you can take advantage of both technology by keeping the contents of your iPad in sync with your computer for free via AVGO’s iPad to computer transfer freeware. Free iPad to Computer Transfer program allows you to make a back-up copy of your videos, movies, pictures, music , playlist, etc. from your iPad to computer so you don’t have to worry about losing the important files from your iPad. You may save the back-up copy to a folder on your computer (disk) or to your iTunes. Also, with the option to save the file/s to your iTunes, you can instantly sync the contents of your iPad to your other iOS devices (like iPhone, iPod, iTouch). Another benefit you can enjoy from Free iPad to Computer Transfer program is that you now have the opportunity to edit videos and photos (copied from iPad to computer) easily on your computer with your more advanced video/photo editing software, then transfer the edited file/s to iTunes and sync it with your iPad so you can use it for office or business presentations and more. Start enjoying all the above mentioned features for FREE, download and install Free iPad to Computer Transfer now!